In my previous life as the editor of a women's lifestyle website I used to go to the odd PR event or Christmas showcase, which was such fun, but sadly I haven't been able to go to any such events since taking on my new job in February as they're always during work hours, sniff. I always found these showcases the perfect places to discover new brands and products offline and so I was thrilled when a little while ago I realised that the blogging community offered something similar in the form of conferences. After the FABULOUS Big Blogger Conference, I hit the Beauty Blogger Awards Workshops and Exhibition this weekend, which was held at London's Olympia conference hall. 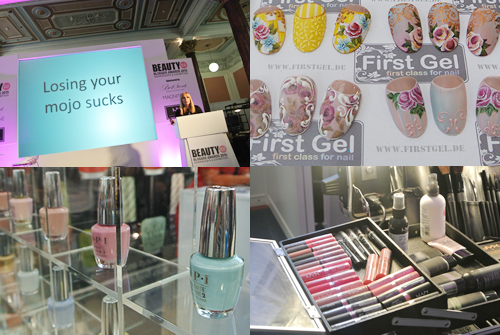 The first part of the morning I spent inside the section specifically assigned to the Beauty Blogger Awards, where there were already some fabulous brands present. Particular highlights were Lava Shells, an amazing massage tool, which of course I tried out; Skin Accumax, a great product for problem skin, and I've had a browse on their website and they have some fab other supplements too that I am keen to try using the £50 voucher they gave bloggers in attendance; Nyx Cosmetics, who had a gorgeous stand and a cool photo booth to boot; and Best Secret, a members-only discount fashion website which gave all bloggers a £40 voucher (minimum £100 spend) and I am already eyeing two bags and a pair of shoes on their site! On top of the exhibition stalls there were a wealth of workshops and I caught the first two on Sunday: 'When You've Lost Your Blogging Mojo – How to Keep the Inspiration' by beauty blogger Kat Clark, and 'How to Find Your Niche' by wedding beauty blogger and make-up artist Jules Cardozo Marsh. I particularly struggle with the latter as I have so many passions, but it was really insightful and both workshops have once again spurted me into action to be better and more focused with my blogging. After the workshops I had a peruse of the massive trade event happening next door; The Olympia Beauty Show. And when I say massive, I do truly mean that it was MASSIVE. I spend a good two hours wandering around, browsing all the stalls and gawking at the amazing products on display and I still didn't see it all. I picked up a load of flyers and inspiration and while I promised myself to not spend any money, of course I ended up spending money. A friend of mine has been raving about MoYou nail art stamping plates for a while now and when I had the opportunity to try them for myself at the trade show I had to pick up a starter kit. For £25 I received two stamping plates of my choice, a large nail polish I could pick out myself, the stamper and scraper you need to apply the art and a freebie eraser pen thrown in as well (normally £5 on its own). Not too bad, and I will keep an eye on good deals on stamping plates going forward. As if I didn't have enough nail polishes already (and I really, REALLY do) I couldn't resist the £1 offer on polishes at The Edge and how cute is the vintage nail file (also £1)?! I was also after a new body butter as my current tub is nearly empty and at the perfect time I came across Cuccio's divine milk and honey scented one (milk and honey is one of my favourite combinations anyway and this one works particularly well), which is a beautifully rich cream and will be perfect for my dry skin. For £5 for a large 8oz tub, I also picked up the gentle fragranced pomegranate and fig body butter as a gift (yes, I have started my Christmas shopping!). And that was everything I purchased on the day, I think I haven't done too badly (even though I promised myself not to buy anything at all, whoops). Everything pictured below was part of the goodie bags, which were magnificent. 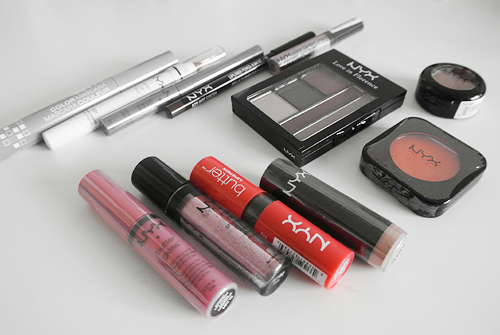 Undoubtedly the most generous goodie bag came from Nyx Cosmetics, which included all of the above! Admittedly these are not all products I use myself but I know my sister does and she'll be very happy with all these goodies, as she's always on the look-out for new products. And I will of course report back on those I try myself as well. More nail polishes, yay! I think I need to get an extra room in my house for all the nail polishes I have... I'm also very keen to try the cuticle care (bottle pictured in the middle), which I hope will help my poor hands through the winter when my cuticles are always suffering from the cold temperatures. I think O.P.I. may be stalking me, how else could they have known that I had nearly finished my current bottle of nail polish remover and decided to give me a massive one (480ml)!? It is a lot and should at least see me through the next few months. 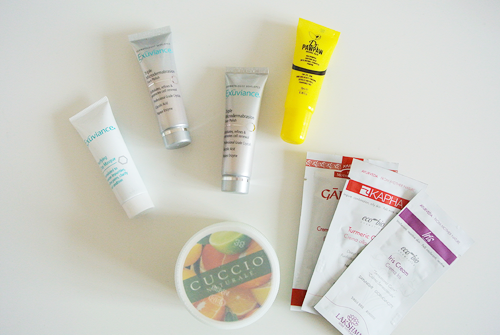 Finally, there were some lovely mini-tidbits, I am especially pleased with the Paw Paw Balm (which has already made itself at home in my handbag) as I am a big fan of the brand (read my review of the product here) and the mini body butter from Cuccio, after I fell in love with their products at their stand at the trade show. And that was my day (or I should say half a day, come 2pm I was absolutely knackered) at the Beauty Blogger Awards. There were some great workshops, inspirations and brands, and I cannot wait to try all my goodies and report back on my favourites. 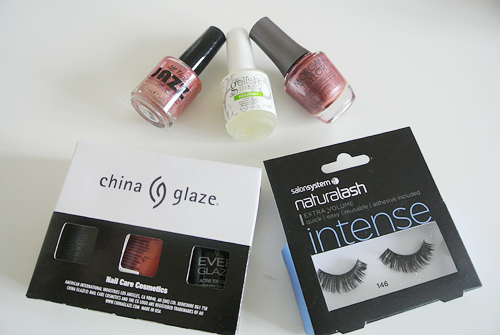 Seeing my slightly biased purchases I sense a nail-themed post in the not-too-distant future!